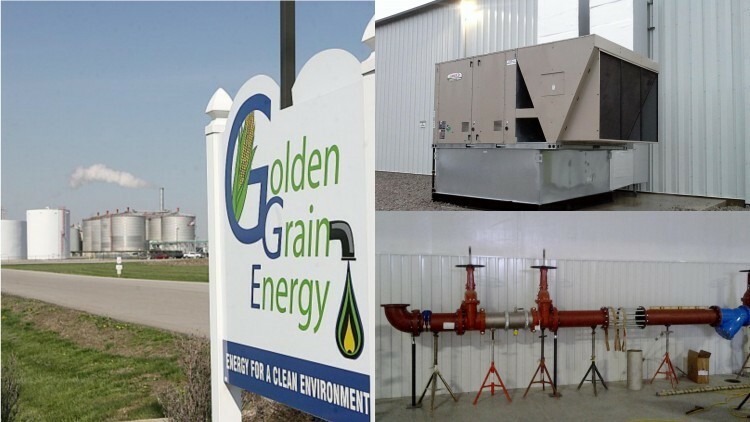 After opening in late 2004 with an initial output of 120 million gallons annually, Golden Grain Energy LLC efficiently grew and eventually doubled its capacity by 2007. By early 2015 they had eclipsed the 1 billion gallon mark. It became obvious that plant cooling capacity would continue to exceed the demand for the present amount of filtered water available for process. However, the infrastructure did not exist to meet the increased demand. Comfort Systems USA Midwest was given a drawing for a 30,000 sq. ft. building and asked to design HVAC and domestic water systems to support a high capacity water treatment plant and maintenance facilities. Comfort Systems USA Midwest has been the prime vendor for all of Golden Grain Energy’s HVAC needs since 2013. The Golden Grain maintenance manager stated, “From the submittal process to the final walk through, all phases of the project went very well. The lead technician assigned to the project took personal interest in the job and seemed to become a GGE employee until it was time to leave”. He went on to say that “Breaking ground in May 2015 to moving in in February 2016” created a condensed schedule. “Partial water treatment systems went online in April of 2016. Full operation of the facility was achieved in late June 2016. This would not have been possible without the cooperation of Comfort Systems USA along with other contractors working on this project”.